Just wondering if anyone can offer any insight on these patterns. 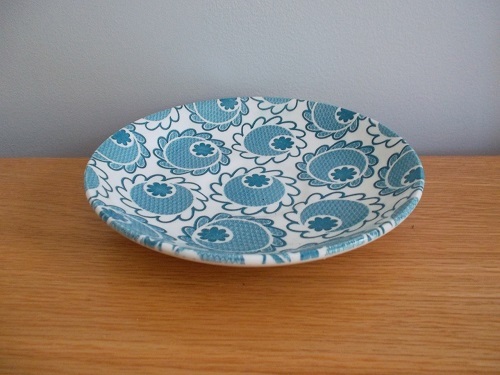 I have two of these plates and I love the design and it'd be great to find more, but it's hard to track things down without a design name or number! Stamp is Genuine Ironstone. These cups just have the "made in NZ" marking (pictured). Does anyone recognise them as Crown Lynn or other? Edit: After browsing the gallery again I spotted what looks like the green mug listed as "cornwall - avondale collection" but it is a little hard to tell from the photo. I suppose the design codes are what I really want to know. When the backstamp doesn't include any further information, how do you find out? Cups don't always have the pattern names and numbers on them ...but the saucers and plates often do. I keep an eye on the listings of several online auction sites and found an auction for Dover that came as a boxed set with 3 other patterns showing on the box, including Cornwall. Hon-john had sent us this unknown pattern some time ago, so I was able to give it a name at last. 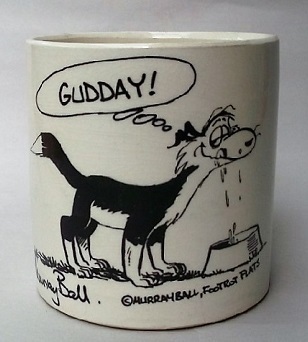 It would be great if I could add your pics to the Crown Lynn Tableware Gallery Giro if you don't mind .. I will credit you with the photos. Crown Lynn Tableware info is the most popular topic on this site ..
No worries, feel free to use my photos as you wish! I love the pattern on the plates too, ever since I found them i've been itching to get my hands on some more of the set, if it exists! Found the name for the brown cup with the pattern .... it's Trent. This also was in a boxed set with Dover and Cornwall, cups and saucers. Had a marvellous time at the Auckland Museum today looking for pattern names and... saw a photocopy of the plate in the first pic, so no colour but the exact same design. Confirmed the Polaris pattern yesterday as the matching cups are in Tango Blue. There was another pattern name for Polaris and it was called Pippi d535 .... so perhaps another colour? There's a cup and saucer in this pattern on T Me at the moment. OOps it's being sold by Banker - how could you!!!! Busted, lol. Seriously, I have more than one and I prefer the plates as I use them more often. It's nice to share. It would be rude not to. Lol. The blue tulip looks fabulicious with it. A friend of mine won a saucer with the exact same pattern but brownish tones! It is pretty cool. I have wanted to know the name of the pattern for the plate for the past 4 years. I have the same pattern dinner set in almost black by Genuine Ironstone, and two side plates in chocolate brown by Kelston Ceramics. Ev wrote: Confirmed the Polaris pattern yesterday as the matching cups are in Tango Blue. This pattern in blue is Polaris barron204 and I would say that Pippi d535 would be the brown version, but I would have to check out the matching cup colour to confirm this.